The TIF procedure treats the underlying cause of GERD/heartburn without incisions. This allows patients to have a robust surgery without the morbidity of incisions on their abdomen. This innovative procedure reconstructs the anti-reflux valve (Lower Esophageal Sphincter) using a device called the EsophyX device. The TIF procedure is performed by introducing an instrument and a camera into a patients mouth and directing it under visual guidance into the patients stomach. The EsophyX device is used to construct a durable anti-reflux valve and tighten the LES (lower esophageal sphincter), thus reestablishing the body’s natural barrier to reflux. It is important that this procedure be performed on a select population of GERD patients by a specially trained physician in order for patients to have superior results. The Tampa Bay Reflux Center is proud to have 80% of their patients with complete resolution of their GERD symptoms off of all antacid medications after undergoing a TIF procedure. For those patients that have a hiatal hernia greater than 2 centimeters, the TIF procedure produces sub-optimal results. For these patients, we still recommend laparoscopic hiatal hernia repair and Nissen fundoplication in order that we can fix the hiatal hernia and cure a patient’s reflux simultaneously. This procedure has now been performed in thousands of patients and to date, side effects have been short-lived and minimal. 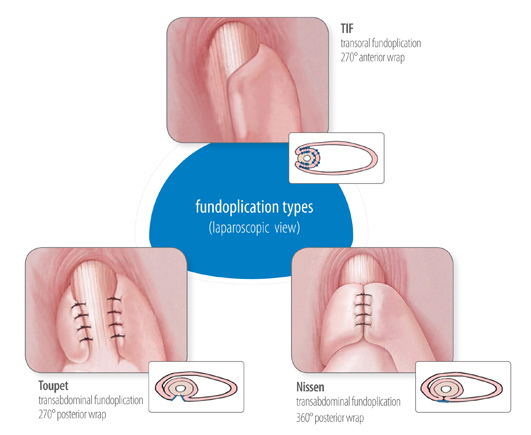 The TIF procedure is performed under general anesthesia. The procedure itself will take about an hour to perform. Patients are then admitted overnight for observation and go home the following day around lunch time. Patients should expect to experience some discomfort in their stomach, chest, shoulder, nose and throat for the first few days to a week after the procedure. Patients will be asked to restrict physical activity for the first few weeks and will be given dietary guidelines to help maximize their success while the tissue heals.